University and sports broadcasters face unique challenges – broadcasting from multiple venues, often miles apart, on a regular basis. Universities in the United States have multiple sports venues – from football and basketball to swimming and track and field, and others. Transforming these multiple venues into a coherent and connected broadcast zone can be a mission impossible. Until now, the only way to offer broadcast coverage to multiple university venues was to install receivers at each and every location. The one receiver per venue/zone is a technical and logistics nightmare for university broadcasters. Every receiver adds more complexity and potential pitfalls – with setup, system stability and picture delay and quality. When camera operators arrive at a university venue to film live video, they first need to perform a complex setup and connect their cameras to the receiver and make sure the receiver is sending signals to the control room, which is usually located at the football stadium. Introducing the Fiber Coverage Extender, a new solution specifically designed for university and sports club campuses where coverage of multiple venues is required. Imagine a wireless video system that extends your coverage 10 fold without the need for additional expensive receivers. Using just one Receiver and one Transmitter and an unlimited number of Fiber Coverage Extenders, you can cover all sports arenas in your campus – the football field, the baseball field, the basketball court, the swimming pool and any other locations. Every arena transmits video to your main or secondary control room, located even miles from the event location. The Fiber Coverage Extender preserves all the features that ABonAir is well known for – robust signal, high picture quality, 7 msec delay, RCP (remote control), Integrated Intercom and more. For years, universities have looked for a way to extend coverage without adding more expensive hardware and creating a logistics nightmare. One Receiver per site is an expensive and complex option and is now obsolete thanks to the disruptive Fiber Coverage Extender by ABonAir. 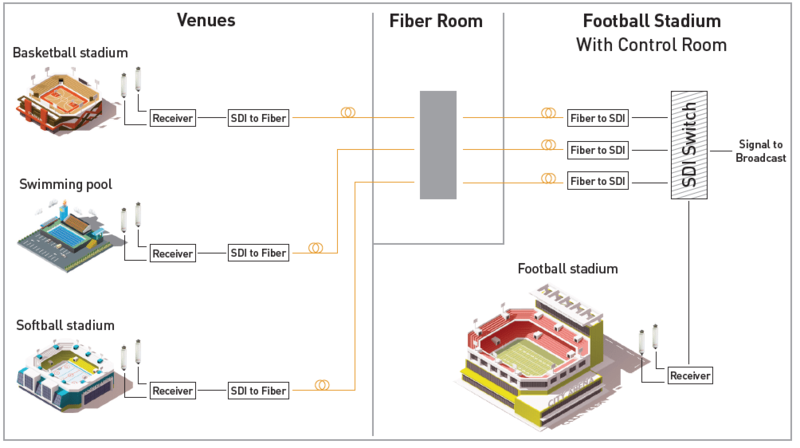 The ABonAir Fiber Coverage Extender was designed and built to solve the multi venue problem in universities and it is tailor made for the multiple sports venue use case. Large universities face impressive challenges. Most American universities have a large stadium, a basketball arena, tennis courts, track and field, swimming pools and other sports locations. At the same time, this campus is controlled from a single, sometimes also a secondary, control room. If you need to cover a university campus with 2, 3 or even 8 different venues, some of them a few miles apart, with only 1 or 2 control rooms, all you will need is 1 Transmitter, 1 Receiver and few Fiber Coverage Extenders. In this scenario, every Fiber Coverage Extender is connected in either Star, Daisy Chain or a mixed configuration. Sports stadiums include many areas that camera teams need to cover – the field, audience, tunnel, locker rooms and the concession area. Fiber Coverage Extenders allow you to cover every area of a sports stadium, even if it is under concrete or a heavy metal structure. When players run from the locker room to the tunnel to the field, one camera can cover it all wirelessly. Coverage will roam from one FCE to another automatically. Many sports stadiums have a practice area nearby, where warmups take place. Fiber Coverage Extenders allow cameramen to cover the practice area as well, unencumbered by wires. Cameras need to cover the race track, winning circle and the stables. In many cases, cameras need to move from one area to another – from the stables to the race track and from the race track to the winning circle – while live coverage is broadcast. Place Fiber Coverage Extenders at each location and cover every area of your sports event – seamlessly and without losing one pixel. Golf courses – 18 or 36 holes – have very large broadcast zones and the FCE solution is the only way for cameras to gain full mobility on the greens. Universities often have multiple stadiums, fields and arenas. Game day is really “multiple game day” and the same cameraman may find himself moving from one event to another during the broadcast. A wired broadcast solution is not practical for multi-location sports. 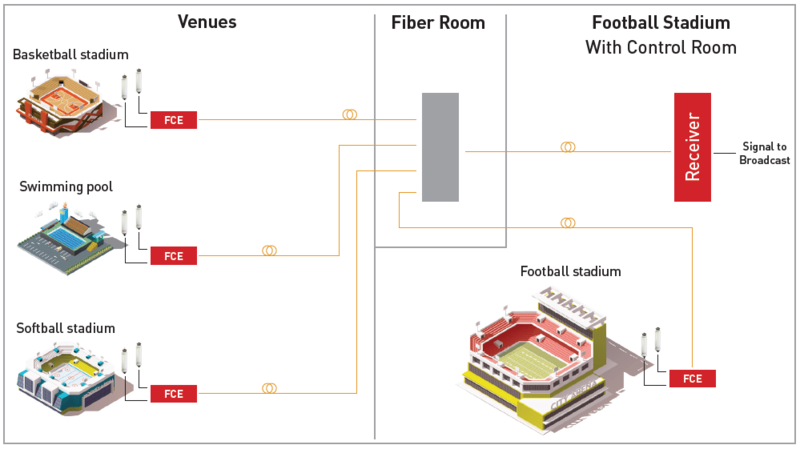 Fiber Coverage Extenders placed at each location allow complete coverage of every sports event. Are you curious to read more? Click here and read more about the ABonAir Fiber Coverage Extender or fill out the below form and we will get back to you.